I love it! 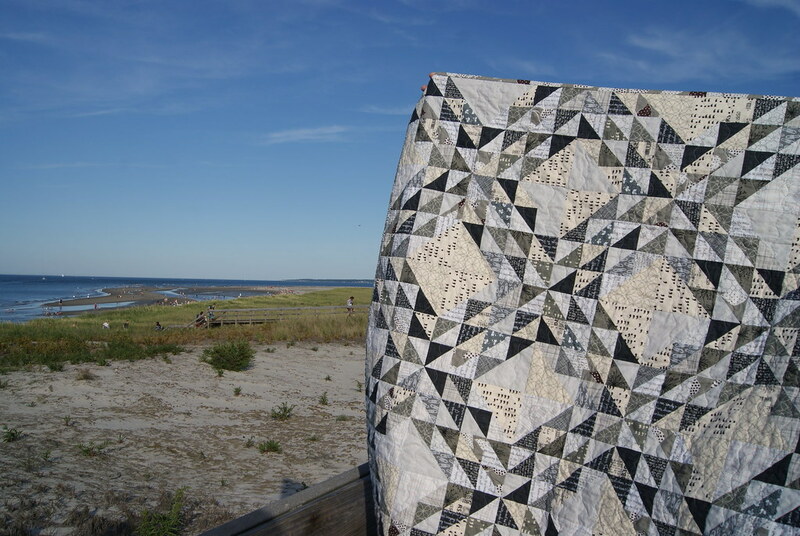 This quilt is on my bucket list and one of my faves from Denyse’s book. 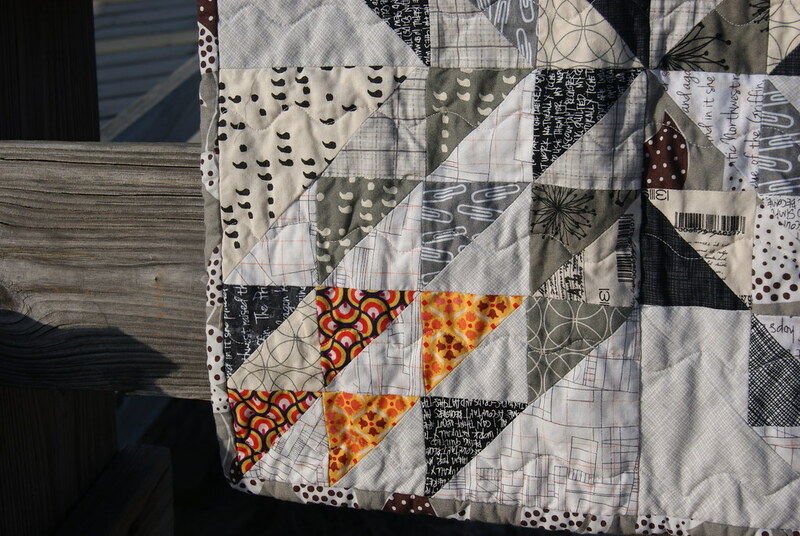 Love the idea of saving trimmed triangles for it! I am totally and shamelessly going to borrow your idea! Beautiful job Laura. I love that first shot of it–it was worth getting a look or two! I look forward to seeing it in person. I think the orange backing was the way to go. It gives the quilt two moods. I really like it! Love it especially the orange backing! Great choice. Love the orange pop in the corner and that you put it on the back. I miss the beach so much; I would soak it all up too if I were you. Looks great! Love all those greys, and then that little pop of orange in the corner. 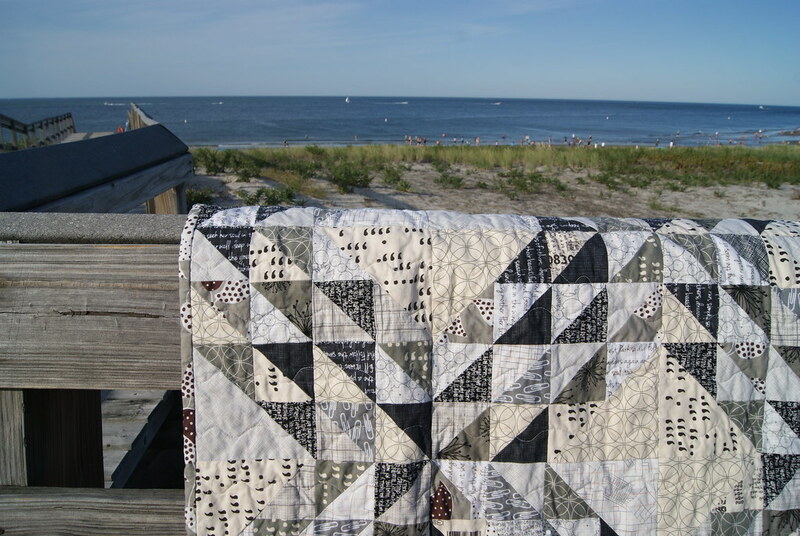 Laura, your new baby quilt is really very nice!! I love the orange triangles in the corner. It is great idea! 🙂 J.
Lovely quilt! I love the contrast of orange and grey. I was going to ask what beach you photographed it at, as I was suspecting Crane’s. Hope you get many more beach days before the snow sets in! 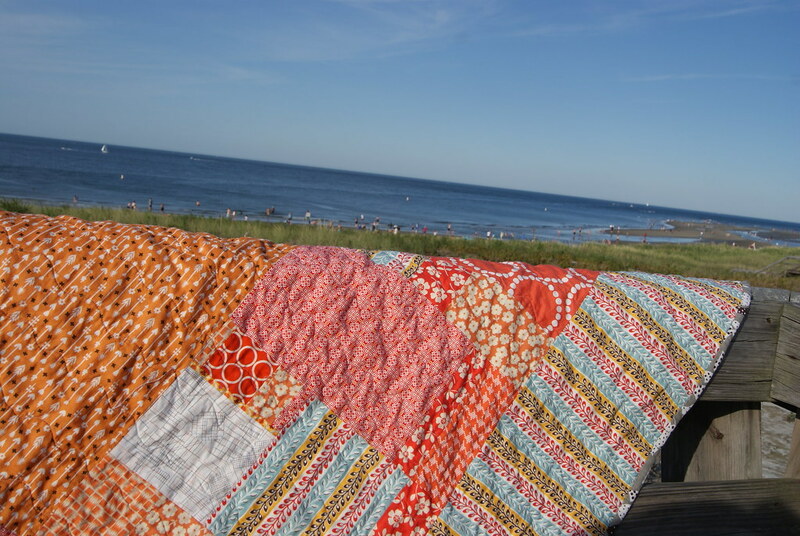 Laura, beautiful photos and of course…..it is a lovely quilt! Another finish…..can’t wait to see it at show and tell!! 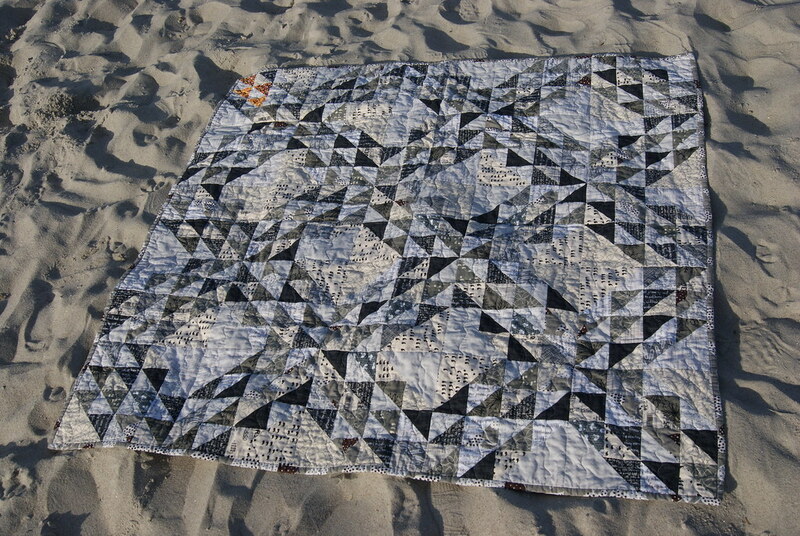 I am sort of liking that simple wavy line quilting. I have used it a few times myself!! This turned out beautifully. I love that it’s all made of scraps. Makes it that much more special. just LOVERLY!!! truly!!! and even better because it comes from the leftover bits. This looks sooo good – and I love the contrast of the backing!! Beautiful quilt Laura and I love the backing too! There is nothing like the beach to nurture the soul. Thanks for sharing. The orange HST’s in the corner make me happy. I knew i was going to love this one!! Just stunning, and i love how you used up bits and pieces from other projects! I can’t even handle how much I love this quilt. And that it’s leftovers. Ahhhh. Love. Love the grey front, bright back combination. And for such a sophisticated non-baby quilt, I would tend to call it a lap quilt 🙂 Great for cuddling up with on the lounge. I am going to have 688 of those HST units after my X-plus quilt- I may just have to do this quilt too- thanks for the idea! 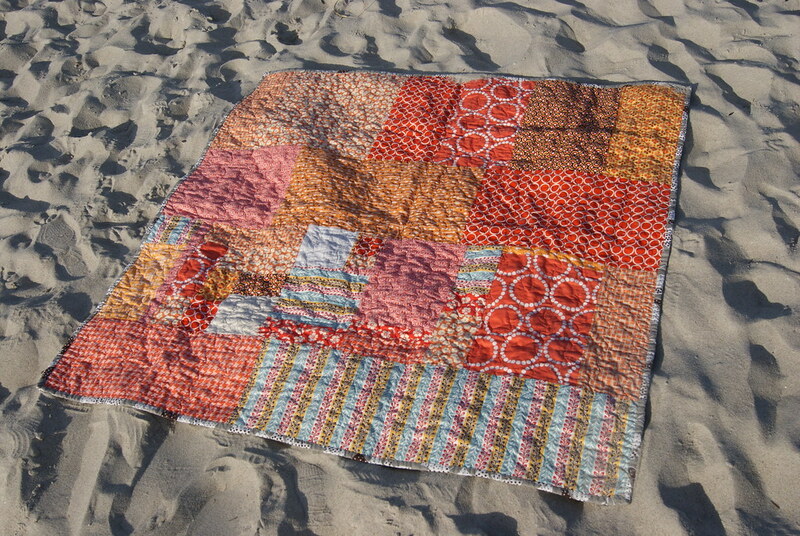 I can hardly believe that this quilt was made from leftovers! I am sew glad you went with orange for the backing. And added that touch of orange to the front corner! Clever! It looks sharp. And no, I don’t want summer to be over quite yet. My kids go back to school in exactly a week. And I will have to cope with my loneliness by spending all my time quilting. Sigh. What a beautiful quilt, Laura. 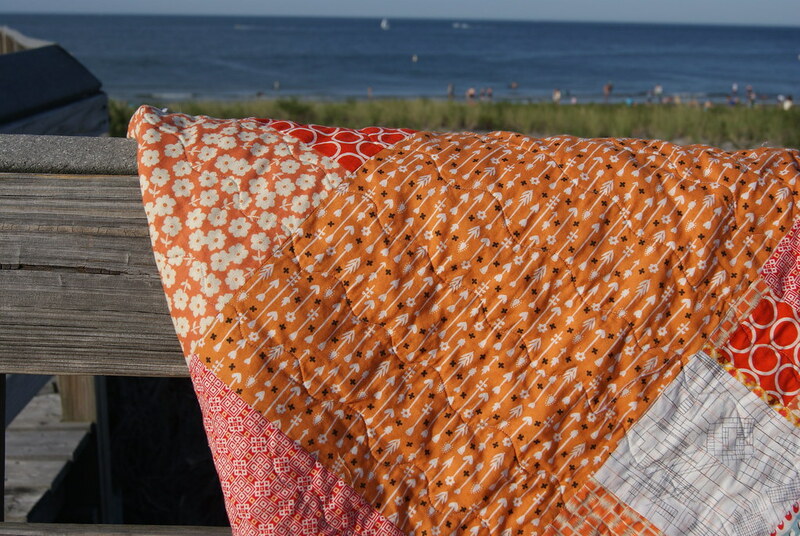 It is amazing how lovely scraps can look, and I do think the orange back was the perfect choice! I think the bottled sunshine is brilliant! i’d keep it too, baby or no. =) it’s cozy in all that grey and warm with the oranges. love! This is so great, I love that you put color on the back. funny I just looked up your post on the extras so that I could make HSTs out of the cut-offs from Tennessee Road Blocks. They are going to be tiny, but cute! Thank you again for the inspiration!